What should I do if I’m stopped on the street? If a police officer stops you on the street, he or she has a reason. The officer may have reason to believe that you are in violation of the law. It’s also possible that a crime was committed nearby and the officer thinks that you might be able to help. What should I do if I’m pulled over in my car? If you are driving a car and an officer signals you to stop, you must immediately pull over. Prior to an officer initiating a traffic stop, they evaluate where the safest location is for the stop to occur. It is at that point they activate their emergency equipment to signal you to stop. Stay in your car. If it’s dark, turn on the interior light. Do not leave your car unless directed to do so by the officer. Keep your hands on the steering wheel. Wait for the officer to approach your vehicle. The officer will request your license, registration, and proof of insurance. Police officers are trained to ask for identification first, then provide an explanation for the stop. Please provide the officer with the required documents. An MSU police officer will always inform you of the reason that you are being stopped. When I am pulled over, why does the officer ask for identification first? The officer is trained to do so. This is so the officer knows the name of the person they are contacting. When a car is stopped at night, why does the officer appear to “sneak up” on the driver and shine their lights into the car? It is a safety precaution for the officer. Officers are trained to minimize their exposure to traffic and potential danger from inside the vehicle. The bright light illuminates the interior of the vehicle. If I’m pulled over for a traffic violation, why do other police vehicles sometimes show up? It is not uncommon for officers who are in close proximity to check on one another, even when they are not requested. Again, this is for safety concerns. Why does the officer sit in the car for so long? What is the officer doing? The officer usually takes the time to verify your driving status and vehicle registration. The officer does this as quickly as possible but there can sometimes be delays in the computer response. Additional time may be added if the officer chooses to issue any traffic citations. I am stopped on a traffic stop and I’m carrying a concealed weapon, what is my responsibility to the officer at that time? When carrying a concealed pistol, you should be aware of State Law. Additionally, you should be aware of MSU’s Ordinance regarding Firearms or Weapons. Can I still park my moped at a bike rack or do I have to park in a moped space? Mopeds (including, but not limited to, ebikes and scooters) may not park at the bike racks starting August 1, 2018. Do I have to register my moped to park in the moped spaces? Yes. Mopeds can be registered at the MSU Parking Office. In order to register your moped with MSU Police Department, the moped must first be registered with the Secretary of State Office (SOS). If the moped spaces are full, can I park in a car space? No. Mopeds must be parked in marked designated moped parking spaces only. Non-affiliated drivers choosing to park in metered or pay-by-plate parking areas are not required to register their moped. However, metered parking must be paid during hours of operation. How were moped parking locations selected? All non-gated parking lots will have spaces designated for moped parking. Vehicle detectors at gated lots are not able to register that a moped is present. Therefore, designated moped parking spaces cannot be installed in gated lots. Will there be a way to secure my moped while it is parked in the parking lots? In spaces that allow 24-hr moped parking, a small loop will be drilled into the pavement. U-locks and chain locks can be attached to these loops for secure parking. Are motorcycle permits valid to park in moped spaces? No, moped permits are required for parking in moped spaces and motorcycle permits are required to park in vehicle spaces. They are not interchangeable. Where can I file a complaint or send a compliment regarding an interaction I had with an MSU Police officer? Please contact us at 517-355-2221 and ask to speak with the shift supervisor or email us at info@police.msu.edu. You can also contact the Police Oversight Committee. You can pay it at the MSU Police Department in the Parking Office, drop your payment in the 24 hour drop box in our lobby, make an online payment or mail a check or money order payable to MSU, to the Parking Office. My vehicle was towed on MSU campus, where is it? Vehicles may be retrieved, depending on the circumstances, from the MSU Police Department 24 hours a day, seven days a week. Along with a tow charge, storage fees may be accrued. Any and all other fees and fines, including unpaid parking violations, must be paid before picking up the impounded vehicle. 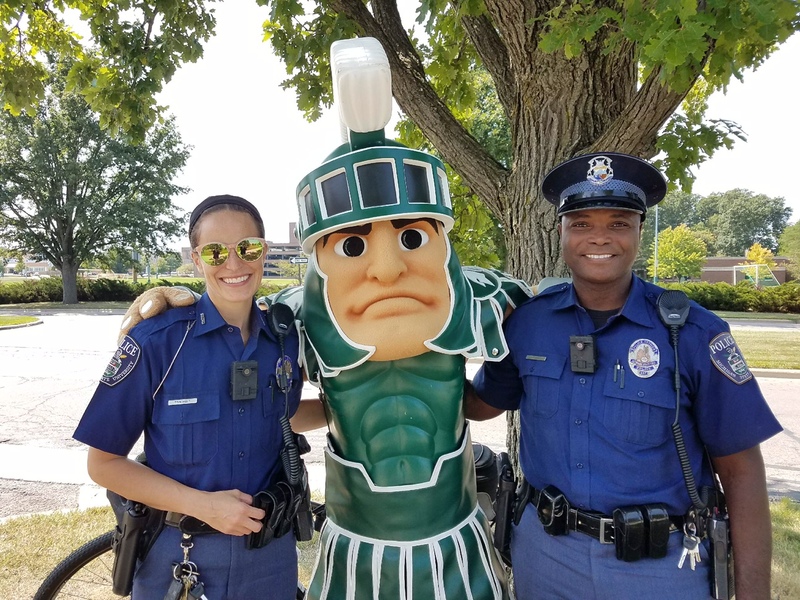 Where can I learn more about becoming a MSU Police Department officer? Visit our recruitment website at recruitment.police.msu.edu. Yes. Information about student employment is on our civilian employment webpage. Are there jobs available for civilians who are not students? Yes. Information about civilian employment is on our civilian employment webpage.